A few years ago, I thought my edge had all but disappeared when it came to running, but after some moderate successes in community races, I started dreaming of developing as a competitive runner. After high school, my running had been either for fun or fitness, but I became hooked on being fast again. I started trying to win, but would become agitated by being passed by faster runners- the nerve of them! The manner in which this perceived competition manifested with my running became toxic to my growth as an athlete. I’m genetically blessed with faster than average leg turnover, it’s as simple as that, but I introduced only as much work as I felt like each race. I had a complete change of heart last year during the Rose Bowl Half Marathon in Pasadena, California. I knew the course well, but the first five miles were hell- I felt shaky and unsure. I was running within a group of five or so women, probably mid-pack for that race, and we all took turns in the lead. I became irritated that they weren’t “letting” me keep the lead, when it occurred to me that if I wanted to get ahead, I might have to push harder, not wait for them to falter. That day, I decided to push my preconceived limits. I set a goal of 20 seconds per mile faster, and to hold that for at least one mile. Soon the awkward feeling I had in the first five miles dissipated and I was flying- I could hold the pace, and go even faster. I glided past each new person within sight, seeing them as goals, not obstacles. I finished the race 4th in my age group, and I had dropped my half marathon down past 1:50, which was 7 minutes faster than my previous best. My race had nothing to do with the other runners, and everything to do with false beliefs I held about my ability and grit. Less than a mile from the finish at the 2015 Rose Bowl Half Marathon. Happy lady, running at ease. For the past two years, I have had the opportunity to challenge myself against some strong women in races. I was honored when a young lady asked to take a picture with me at a mile race. She placed second and myself third, and I began to sense that team spirit that I had loved so much about my high school cross-country team. I feel that the women I run against are friends, not foes- especially the fast ones! They pull me and I push them. I was floored when this young lady asked for a picture together after our neck and neck race. I’m going to keep with the tribe now as best I can. I know sometimes I will try to run harder or faster and fail, but I’ll learn more about myself in the process. I recently went running with a two friends, and they kept a pace that was faster than I could do that day. Instead of being annoyed that they were going faster, I was excited to be running behind them, because their hard work pulled me to be better. 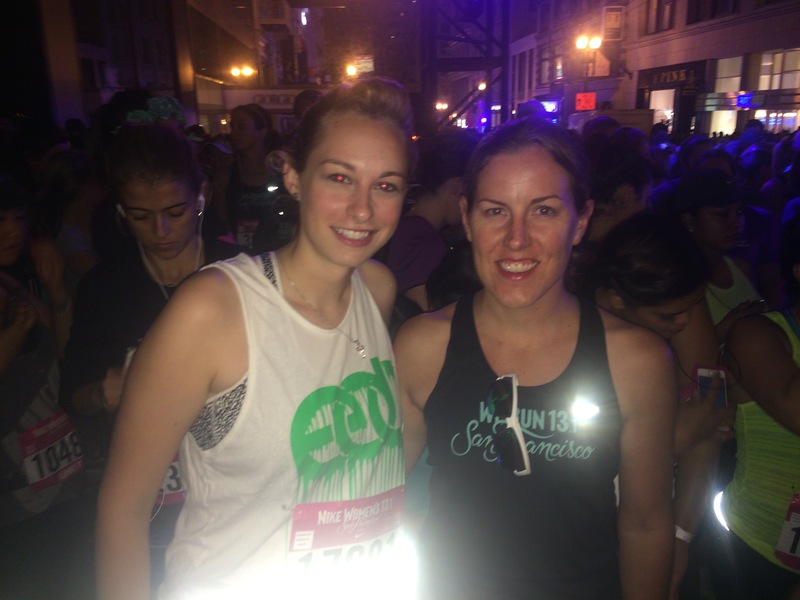 Finding a familiar face in the crowd at the Nike Women’s 2014 Half Marathon starting line! 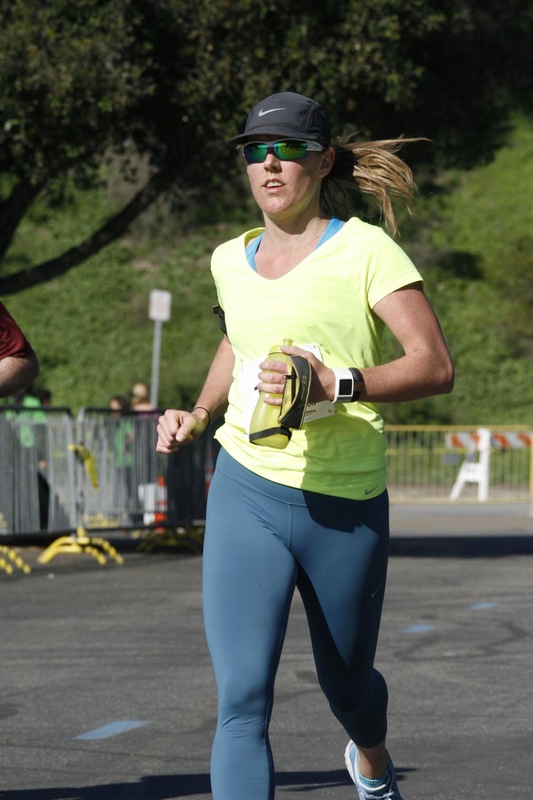 In 2014 I completed my first marathon, the Asics LA Marathon. I was in love with the enthusiastic civilian support I encountered along the route. I accepted candy from strangers. I ran without headphones, and entertained myself taking in the crowds both in the race and on the sidelines. My favorite stretch of the course was West Hollywood, where the wide berth the previous onlookers gave us was removed and all the dashing ladies and gentlemen of WeHo bumped and grooved right up on us, creating a sort-of running Soul Train. This year I decided to sign up again, with reservations from the start. Though the first 18 miles of the 2014 marathon had been great, I suffered pretty intensely for the last 6. In addition, there came another feeling of foreboding in the days leading up to my would-be second LA Marathon, and it had nothing to do with the actual running. I was in a totally negative space around personal issues, and my head was not in the game. I believe our thoughts influence our behavior, even down to one foot in front of the other. 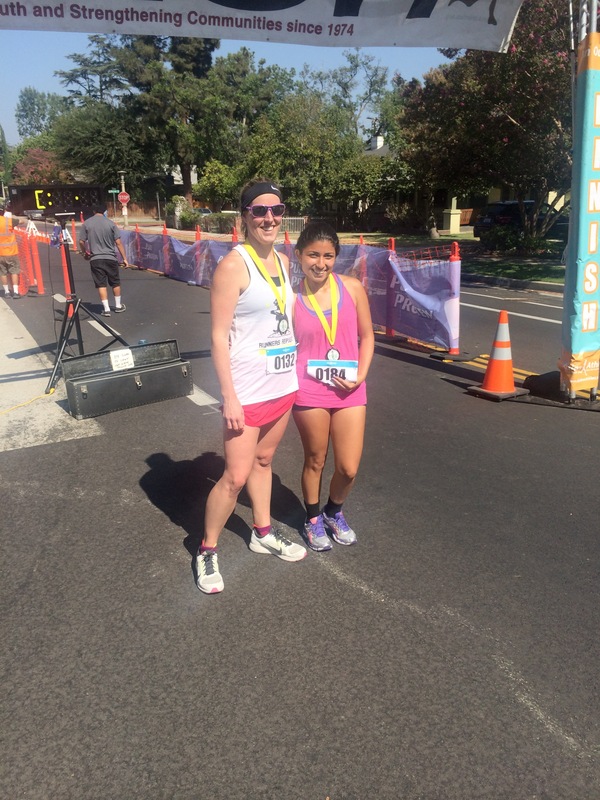 Back to the race: My pre-race adventures with my running buddy Annie (see last post) finally had me excited to make the trek to Santa Monica. I departed the Dodger Stadium parking lot patient and intent upon running a smart race. After 40 minutes of running, I was warm and energetic. I was keeping about a 9:30 pace, which was sustainable. I grabbed a cup of whatever at the mile 5 station, and started running on the diagonal back to the middle of the pack. I missed seeing a dip in the road, and I felt my left ankle start to roll. I tried to stay upright while my ankle continued to invert. I fell anyways. I got up and tested it out, hobbling, walking, and even trying to jog…my ankle felt what can best be described as “loose”. I went into planning mode. The next official first-aid table was miles away, according to my marathon app. Instead I found a civilian-managed aid table and asked for help. By the time the ambulance arrived my ankle was the size of a baseball. Good move not trying to go further. A very kind woman (I want to say her name was Lisa but I was in a daze), held ice on my ankle and kept me alert and breathing normally as I started to go into shock from the pain and trauma. I couldn’t believe what was happening to my body, as other runners continued onward right past me. At the hospital, I found out my ankle was broken. Through the mental fog, that settled in with the addition of morphine to my physical and emotional exhaustion, I tried to organize in my head what to take care of next. My phone was dying and I needed to reach Annie to let her know I wouldn’t be at the finish line. I needed my gear check bag because it had my keys in it. I wouldn’t be able to run or work. I work retail, managing a stockroom, which is no easy task on crutches. I finally was released from the hospital and took a cab back to Annie’s house. Luckily I had given my spare keys to a friend that house-sat for me earlier that month, and I was able to track her down to get the keys back that day. LESSON #1: Be careful when approaching and departing water stations. Its like the zombies are attacking. Everyone is running on the diagonal and completely entranced in their own movement. LESSON #2: Just freakin’ fall. Just fall. I’ve fallen a lot on my runs, and learned how to float down with minimal scratching and bruising. This particular time I was afraid of getting trampled or tripping people. I wish I hadn’t been so considerate. A foot to the face or serving as a landing pad would be well worth avoiding a broken bone. LESSON #3: Keep your damn keys on you if there is a lot of mileage between start and finish, say oh, 26.2 miles. Until this race, I had always kept my keys on me for races of distance longer than 10k. You just never know.